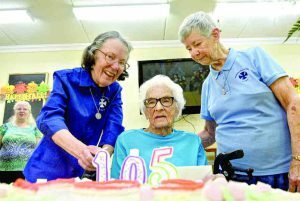 Sister Helen Lange, a member of the Benedictine Sisters of Florida in Saint Leo, celebrated her 105th birthday on Sept. 28. There were 75 guests at the party, including three relatives, according to Cheryl Chadick, development assistant for the Benedictine Sisters of Florida. The relatives who came to the party were Sister Helen’s cousin, Joan Schmidt, from Brandon; and, her niece, Monica “Shotsie” Keyes, who traveled from Salem, Virginia. Keyes was accompanied by her daughter, Stefanie Martin, who is Sister Helen’s grand-niece. Kym Hoerr honored Sister Helen with three dozen roses, Chadick added. “The party was a huge success. Sister Helen looked beautiful, as usual,” Chadick said. 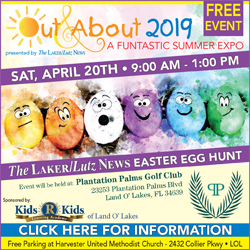 The festivities were held at Heritage Park Health and Rehabilitation Center in Dade City. 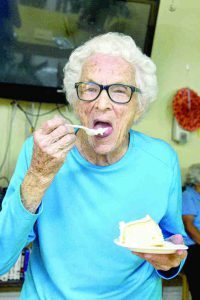 Sister Helen, formerly known as Laurina Lange, was still a teenager when she traveled by train from Texas to Florida to pursue the religious life, according to an Aug. 17, 2016 Laker/Lutz News report. The year was 1930, and she was accompanied by four of her cousins — Irma Multer, Pauline Block, and Rosaria and Rosanna Matthiesen. They, too, had decided to answer God’s call. In the account, she describes growing up on a farm in Olfen, Texas. Her family prayed often, enjoyed making music, and had frequent gatherings with friends and relatives, her memoir says. One of her favorite times of the year was Easter. “Holy Week was truly Holy Week. There were no radios, no running around, no dancing or partying,” her memoir says. Standing before attendees as they sing ‘Happy Birthday’ at her party, Sister Helen takes the first taste of the cake celebrating her 105 years. “On Holy Saturday, all of us kids were sent out to pick flowers to build Easter nests for the bunny to come. While we were out hunting the flowers, little did we know that mom was busy dying the eggs — which we never saw until Easter morning. “We made small nests with the wildflowers we picked out in the fields. She enjoyed shopping days with her mother, her memoir reports. Once the necessary items for the household were purchased, she and her mother would stop by the drugstore for an ice cream soda. “They only cost 25 cents back then,” her account says. “Another favorite treat was a chocolate bar with marshmallows and nuts. This was called a Tango. It was only five cents,” the memoir adds. Of course, living on a farm required hard work. There was “cotton to chop, cotton to pick, maize to head, tractors to run, cotton to haul to the gin, repairs to be done. Too many chores to mention,” the book recounts. And, she attribute her family’s deep faith as a key influence in her decision to pursue the religious life. Over the years, Sister Helen would be a teacher, a band director and a principal. She would oversee a hostel for visitors from other countries. And, later, she would work in elder care. She also moved around quite a bit. 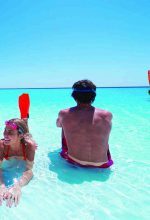 Her first assignment took her back to Texas, but she also worked in New Orleans and Slidell, Louisiana, and in various parts of Florida, including San Antonio, Venice, Sarasota, North Miami, Ocala and Jacksonville Beach.